There’s only a few paintings that the art world and historians feel are significant enough that they are given their own place in encyclopedias and on Wikipedia. This painting by the Korean artist Jeong Seon (1676-1759). Jeong loved this mountain. We know that he painted it at least 100 times based on his surviving works. There are numerous mentions of this painting and the mountain is depicts on the web. It has unfortunately been given a number of different names. Part of that confusion stems from the seasonal names the Koreans use for this beautiful mountain. In the spring, it is called Kŭmgang. In the summer, it becomes known as the place where the spirit dwells or Pongraesan. It is the hill of colored leaves or Phung’aksan in the autumn. And, Koreans call their beloved mountain stone bone mountain, Kaegolsan in the winter. That said, the mountain is most refrequently referred to as Kŭmgangsan. The mountain is one of the best-known mountains in what is today considered North Korea. (Remember, during Jeong’s lifetime, Korea was a single, unified country.) It has only been since 1998 that the area was opened to tourism. In 2002, the area around the mountain became a “Tourist Region” which has allowed millions to visit the region, including tourists from South Korea. The fragile peace that holds between the two Korean states has led to much discord and the Mount Kumgang Tourist Region is often in the middle of those disputes. Access by South Koreans is limited and is often denied. It is in some ways ironic that this painting of a mountain, located in North Korea and kept out of reach of South Koreans, is classified as the 217th National Treasure of South Korea. That classification was made in 1984, when South Koreans had not been permitted to the region since the country was divided during the aftermath of World War II. The name of the painting translates to “General view of Mt. Geumgangsan” or The Diamond Mountains. 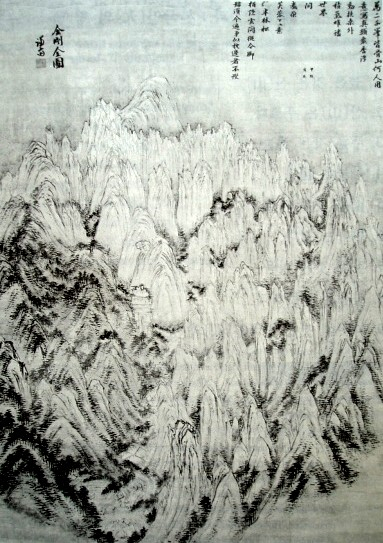 Of all of Jeong’s paintings of this mountain, this is the largest at 130.7 cm tall by 94.1 cm wide and painted with India ink. It depicts Naegeumgan, the Inner Mt. Geumgangsan. The painting includes 12,000 peaks. Birobong is the highest peak and is in the background.